Local shares looked like ending the day in positive territory after Wednesday's bloodletting but an eleventh-hour dip sent the benchmark inching into the red. That sell-off in the last 30 minutes or so left the Straits Times Index (STI) down 15.77 points or 0.46 per cent at 3,428.18. Turnover came in at 2.7 billion shares worth $3.5 billion, markedly up on Wednesday's 2.03 billion shares worth $1.9 billion. Gainers pipped losers 220 to 216. The local bourse was a visible outlier in the region, with most other Asian markets logging gains as the shock over Italy's political crisis dissipated. Benchmark indices in Japan, Hong Kong, China, Australia, South Korea and Malaysia put up a stronger showing and pared back Wednesday's losses. The gloom was lifted with a recovery in Italian assets, while the euro rallied from a 10-month low and United States shares cut their losses with gains overnight. Upbeat Chinese manufacturing data also buoyed trading sentiment ahead of the release of some key numbers later in the day, including euro-zone inflation. "A better-than-expected reading will support proposals for ending quantitative easing and beginning the normalisation process," said FXTM chief market strategist Hussein Sayed. Of the local banks, only DBS Group Holdings rose. It added 14 cents to $28.37 while United Overseas Bank slipped 22 cents to $28.14 and OCBC Bank lost six cents to $12.54. Venture Corp led the gains, jumping 45 cents or 2.2 per cent to $21.10. The stock was one of the day's most active, with 34 million shares worth $705 million done. The gains come ahead of Venture Corp being added to the MSCI Singapore Index from today, following MSCI's semi-annual review. Locally listed Dairy Farm International will join MSCI's Hong Kong index while Top Glove will be added to the Malaysia index. Dairy Farm fell 4.2 per cent while Top Glove advanced 2 per cent. 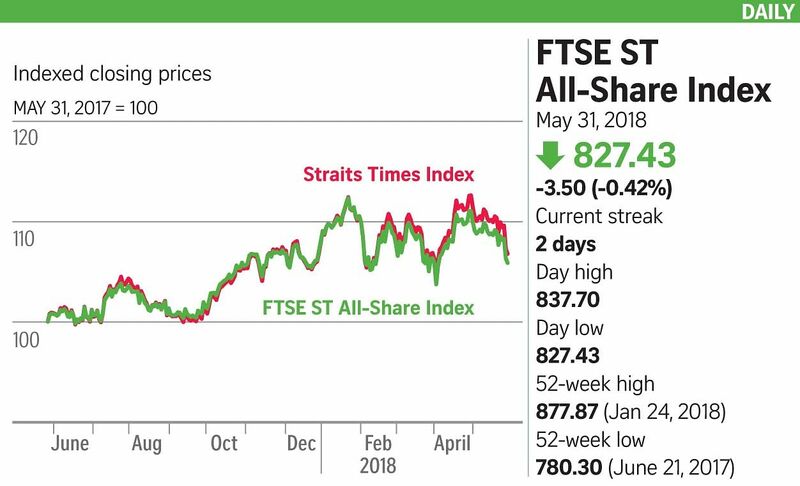 As a result of the review, Hutchison Port Holdings Trust (HPHT) and StarHub will be removed from the MSCI Singapore Index and included in the MSCI Singapore Small Cap Index. HPHT slipped two US cents or nearly 7 per cent to 27.5 US cents and was the most actively traded, with 568 million shares worth US$158 million done. The day's second most active was StarHub, losing seven cents or 3.5 per cent to $1.93. It has been under selling pressure in recent days after the Discovery channel said it will pull 11 channels from StarHub's offerings.